What’s best for low grade plastics? With levels of waste plastics rising in the UK as a result of China’s National Sword scrap import policies, the debate is picking up over what to do with them. Landfilling, rather than incineration, might be the better option, suggests Keith Freegard, Axion Director. China’s crackdown on imports of contaminated recyclables is leading to an ever-increasing stockpile of waste plastics materials worldwide. Tackling this problem waste stream will probably lead to increased incineration of waste to produce energy as the ‘best’ solution. An attractive option perhaps, but when the carbon produced by that process is taken into account, is it really the best environmental solution? Creating energy from waste also produces between 25% to 30% residual incinerator bottom ash (IBA), which still requires waste disposal or long-term storage. Although generating heat and power from waste sounds appealing, it is inefficient when compared to burning gas in a modern generator system. Burning natural gas also produces fewer emissions and there is nil solid ash waste to dispose of. The carbon release from waste incineration needs to be considered and compared to the alternative methods of generating an equivalent amount of electrical power. Typical Energy from Waste plants have efficiencies of up to 30% for converting feed material into electricity; in contrast, a modern Combined Cycle Gas Turbine’s efficiency is typically about 50%. 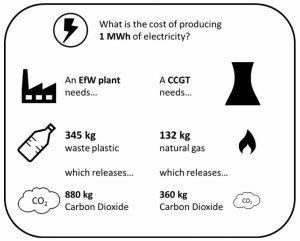 As shown in below, this disparity in efficiencies means that producing 1 MWh of electricity from a CCGT produces just 40% of the CO2 emissions for the same amount of energy made from plastic incinerated at an EfW plant. It is true that a best-in-class EfW plant with integrated heat recovery (i.e. CHP plant) can recover a further 35% of the available energy from the waste fuel; however, this heat could instead be generated by a natural gas boiler that has an efficiency of at least 90%. Even taking this additional heat-efficiency into account, a combination of CCGT and boiler still only emits about 65% of the CO2 of the leading EfW plants. Using the CO2 metric alone suggests that it makes more sense to bury large amounts of plastic in a long-term ‘carbon sink’ in the ground and efficiently combust natural gas to satisfy our immediate power needs. However, until world leaders are prepared to transform the taxation on fossil-based fuels in a way that truly reflects the high environmental cost of ‘free carbon release’, then this numeric analysis remains an esoteric academic study. Perhaps we should start by calling end-of-life waste incineration technology ‘sky-fill’ to compare it with the alternative ‘land-fill’ disposal route for plastic-rich carbon mass? Increasing incineration capacity also stifles innovation in alternative resource recovery technologies because investment is diverted away from developing new processes towards building huge plants for burning materials to inefficiently create power. Having first raised the ‘landfill or incineration’ question more than 12 months ago, I still believe that the best environmental option may well be to store the waste plastics in a controlled landfill facility and then to ‘mine’ them back at a later date when new re-processing capacity becomes available. Effectively acting as a long-term ‘carbon-sink’, these plastic materials could be extracted for recycling in the future if a new-process made this both technically and economically viable at that time. Climate change concerns us all and efforts to control rising global temperatures have included a focus on the uncontrolled burning of fossil fuels in many parts of the world. The huge shift in corporate and national energy-habits required to leave fossil fuels in the ground will only happen with a Carbon Tax placed on the generation of electrical power that is directly linked to the tonnes of CO2 released into the atmosphere per unit of power created. If that happens, it might then be the time to return to that ‘mine’ of carefully stowed thousands of tonnes of good plastic and look again at the economics of turning it into new polymer. With a huge carbon tax slapped on burning it, then the economics would probably work. So these plastics may not have to stay in the ground for too long. Looking at the bigger picture, we should all be concerned about the wholesale damage to our planet caused by the completely uncontrolled burning of fossil fuels. That’s what we’re doing when we’re burning plastic that’s encapsulated amongst the mixed MSW we put in our black bin bags. The short-term political and economic viewpoint is that ‘we’re getting some electrical power from it so it must be a good thing to do’. But this I think reflects the market failure created by our currently very high landfill taxes that are not balanced by an equivalent taxation method to discourage free ‘sky-fill’. It’s a complex and challenging issue that reaches out over the next 20 years; a critical period in our history. Until we get a carbon tax that puts some seriously big pound notes on the cost of throwing carbon into the atmosphere, I don’t see there being any real change. After all, the Earth doesn’t have a bank account – it’s only us humans who operate under that monetary metric. There are 37.5 million cars on the road in the UK – how many of them use recycled plastic? The car industry has to join the rest of the UK in moving towards a circular economy. This requires designers and manufacturers take action to ensure that recycling is paramount; this webinar will lead the way. Please register for the webinar on the BPF website here. Plastics are indispensable in many areas of our modern lives, yet questions over the material’s sustainability are rarely out of the headlines these days. Are biodegradable, compostable and bio-plastics really a better environmental solution? Richard McKinlay, Head of Circular Economy at Axion, offers his opinion. Bioplastics are made using renewable feedstocks rather than being derived directly from oil. Bioplastics can be used in the production of conventional polymers that can be recycled, such as recycled PET, or biodegradable polymers such as PLA. Axion is undertaking further research into increasing recycled aluminium content in new vehicles as part of REcycled ALuminium Through Innovative TechnologY (REALITY), a new £2 million collaborative project led by Jaguar Land Rover. Working with other consortium partners, Axion will focus on techniques for sorting and separating specialist alloys from aluminium derived from end-of-life vehicles. Part-funded by Innovate UK, REALITY is an extension of the REALCAR (REcycled ALuminium CAR) projects, initially launched by Jaguar Land Rover in 2008 to create a closed-loop process for post-industrial aluminium scrap from its vehicle manufacturing. The original project and subsequent work with suppliers enabled Jaguar Land Rover to reclaim more than 75,000 tonnes of aluminium scrap and re-use it in the aluminium production process in 2016/17. The three-year REALITY project builds on the success of this earlier work. Axion’s research will focus on proving the technical and economic viability of separation techniques for the many different non-ferrous metals, such as zinc, copper and brass, from the scrap aluminium, and for separating the different aluminium alloys from each other. The new project will consider advanced sorting technologies and evaluate the next generation aluminium alloys for greater recyclability. Axion’s team will work on developing the sorting technologies for recovery of high-grade recycled aluminium. Axion will evaluate and optimise sensor-based sorting technologies alongside collaboration with Novelis, Norton Aluminium, Warwick Manufacturing Group, Brunel University and Innoval Technology. Axion is calling for the creation of greater demand for recycled materials in the UK following China’s decision to restrict imports of waste paper and plastics. Axion Director Keith Freegard says that although the changed rules imposing a maximum 0.5% contamination level in imported materials present a ‘huge challenge’ in the short term, the UK should be looking at the opportunities this situation creates. Urging the creation of more sustainable business models like Axion’s, which recycles materials from end-of-life vehicles and WEEE, he says a ‘supportive legislative framework’ would be needed to produce the right conditions for a ‘healthy, strategic resource economy’ in the UK. creating a competitive circular flows of materials back into multiple manufacturing sectors, such as construction, vehicles, electronics, and packaging. Further action should include public sector procurement measures, which favour sustainable products both in design and use of recycled materials, and encouraging new product design with mandatory use of recycled/recovered materials at high percentage levels. He points out that the Commons Select Committee the EAC (Environmental Audit Committee) made this point just before Christmas, calling for a producer responsibility compliance fee structure that stimulates the use of recycled plastic, rewards design for recyclability, and increases costs for packaging that is difficult to re-use or recycle. The EAC called for the introduction of a mandatory requirement of 50% recycled content in the production of new plastic bottles by 2023. This would create demand and stimulate a circular economy for plastic bottles; fitting with suggestions made by the BPF Recyclers Group over the last five years. Keith concludes: “I think the demand creation in ‘materials hungry’ industries is where there really needs to be some more Government intervention in terms of strategic policy. Wednesday 14th March, 09:00 Axion Polymers, Trafford Park, Manchester. Axion is hosting a ‘Selling to the Circular Economy’ workshop on behalf of Made in Britain. The event is aimed at businesses who want to buy and sell sustainably and will be of interest to manufacturers working with provenance marketing and the circular economy. Tour of Axion’s advanced processing plant which converts non-metallic waste from end-of-life vehicles and waste electronic goods into recycled plastics, aggregates for construction, and alternative fuels supplying to energy from waste plants. From oxygen masks to advertising banners, PVC recycling is crucial for a circular economy. What can be collected and recycled? What are some of the current achievements in this area?